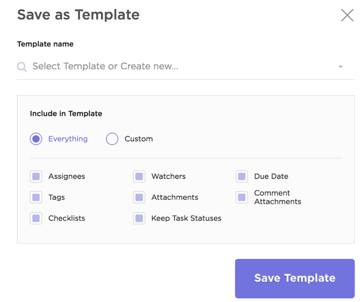 With Task Templates, you can re-use tasks with ease! This is perfect for things like processes, events, and anything that you'll use again in the future. Create Task from Template: This will immediately create the task in a new window after selecting a template. Load Template: This will load the template into the create task window you have open already, so you can edit it before creating it. Load Template into Existing Task: This acts as a merge between the templated information and the details already in your task. Note: Description, subtasks, tags, attachments and checklists will be merged into this task. Assignees, watchers, priority, and dates will be replaced in this task by the template. With this feature, you can choose a new due date for a parent task, and all subtask dates will be adjusted (remapped) based on the difference. For example, if you increase the parent task due date by 5 days, all subtask dates will also be increased by 5 days. This is extremely useful for events as well as things like processes that are time based. Let us know what else you would like to see with Task Templates on our feedback board!